The International Association for the Study of Pain (IASP) defines pain as an unpleasant sensory and emotional experience associated with actual or potential tissue damage. Pain is of three types; acute, chronic and cancer pains. Acute As the definition says it’s a very unpleasant experience affecting the quality of life and mental health. Most of the time pain is a symptom of a disease or a damage happening in the body. Pain happens when your body is hurt by injury or trauma, infection, inflammation and so on. Sometimes it could be coming by the compression of a nerve root and actual cause of pain can be away from the site of the pain. Sometimes some pains – especially chronic pain- stays even after the cause has been removed which is then considered as a disease rather than a symptom. Ayurveda says that always pain is associated with the imbalance of air factors (vata). Ayurveda identifies accumulation of toxins in the body and activation of nerve response as the two major pathology involved in pain. Every vital part of the body requires an adequate supply of oxygen for its operations. As toxins accumulate, it leads to deprivation of oxygen, which makes the body tense and then leads to pain. Toxin can also result into inflammatory response which can contribute to inflammation and cause pain. – If you have experienced pain, you can understand that your experience with pain is completely different from someone having same disease with more or less same degree. Ayurveda says that body types, immunity and General well being affects ones intensity and tolerance of the pain. – Ayurveda understands the difference among humans as Ayurvedic body type. They are vata body type, pitta body type and Kapha body type. Vata body type tend to develop nerve pains easily. Migraine, trigeminal neuralgia, restless leg syndrome, fibromyalgia, to name a few. In Vata body type, pain often occurs due to exposure to coldness, or with consuming cold eatables. It arrives with symptoms like dry skin, stiff joints or intestinal uneasiness. Pitta body type can develop inflammation easily leading to pain. Pitta body type allocates pain when exposed to excess heat, and accompanies swelling or redness. You may feel fever, diarrhoea or irritability while suffering from pitta pains. Kapha body type generally have high tolerance to pain and develop sinus head aches, pain from high serum lipids, etc. Kapha pains tend to carry stiffness with swelling. The pain aggravates mostly in cold or wet weather conditions.This can include mucus secretion and heaviness. – Eat nutritious foods. Make sure your body is getting enough iron, Magnesium, Manganese and Zinc. – Include green leafy vegetables, beetroot, asparagus, sultana, dates, sesame seeds, pumpkin seeds, basil, fresh ginger, turmeric, curry leaves in your food. – Drink adequate amounts of water to prevent stiffness. – Include healthy fat (nuts, drizzling oil to salad, rice or on breads) to lubricate muscles and joints and to improve flexibility, healing and pre ent injury. – Exposure to morning and evening sun rays to improve Vitamin D. Sun rays also help with reducing pain by the infrared rays in it. – Oil massage: Self massage or massage from your personal masseuse/ masseur helps to to improve general health, flexibility, calms nerves and reduces stress. Use of Ayurvedic herbalised oils can boost results. – Practice gentle exercise and Yoga to improve body functioning and reduce toxin accumulation. – Practice mindfulness and meditation to relax the body, calm nerves and reduce stiffness and anxiety. 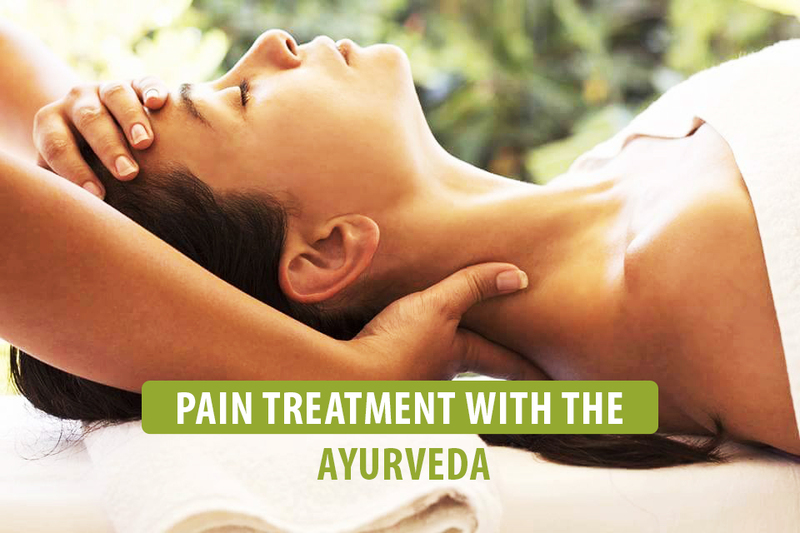 According to the cause, nature and duration of the pain, Ayurveda offers a wide range of therapies and herbal combinations to manage and heal pain. It’s highly recommended to begin with a consultation as this helps your Ayurveda practitioner to decide the most appropriate therapies and the herbs for you. There are herbal comibinations to take internally which helps to improve metabolism and correct/manage pathology of pain. Oil massages (Abhyanga), liquid massage (Dhanyamla dhara), pouch massage (Pinda Sweda), steam therapies, etc are recommended as needed. Multiple sessions may be needed. Abhyanga is recommended to lubricate the body, relax the system and calm nerves. It’s highly recommended for most of the pains. Liquid massage (Dhanyamladhara) is recommended for inflammatory pains. Here massage is done by pouring warm fermented tea over body. Pouch massages gives deep tissue massages and generally recommended for muscle, tendon, joint and spine disorders. The pouch can be made with herbal powders or fresh herbs as needed. Steam therapies helps to improve circulation, calm nerves, alleviates stiffness and helps with detox as well. Your practitioner will decide the most appropriate therapy with the right herbs and the number of sessions needed after the initial consultation. Sometimes Ayurvedic detox therapies May be advised for better results and/or prevention. Dr Rafeena offers a thorough and hassle-free consultation, which properly understands the origin of the pain. Through proper massage treatments and detox therapies, you can leave the pain aside with ease. Treatments like Pizhicchil and Abhyanga can give utmost relief to your pain. For booking a treatment or knowing more about the aspects of pain management, visit our website or call us on 0469-928-491.